I have not written for a while, busy as I was with coursework deadlines, but in the last two days I have spent some time with plum trees which felt worth sharing. Yesterday I helped the Plant Health and Seeds Inspectorate (PHSI) pick leaves from the orchard for testing for plum pox virus. 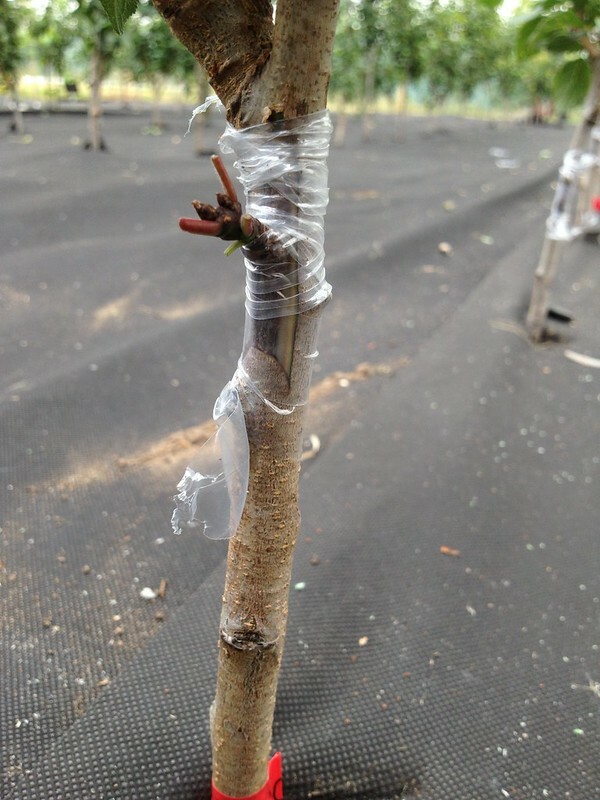 We picked 24 leaves each from 125 of the 127 trees that constitute the new plum orchard (2 of the trees did not have enough leaves on them to provide a full sample), with gloved hands, changing gloves after every plant to avoid cross-contamination. The leaves were sealed in plastic bags and kept in a cool bag until sent for testing. Today I was helping our fruit specialist with chip budding plums, something I had been looking for. The process does not look too difficult, but of course it's all in the skill of the practician. 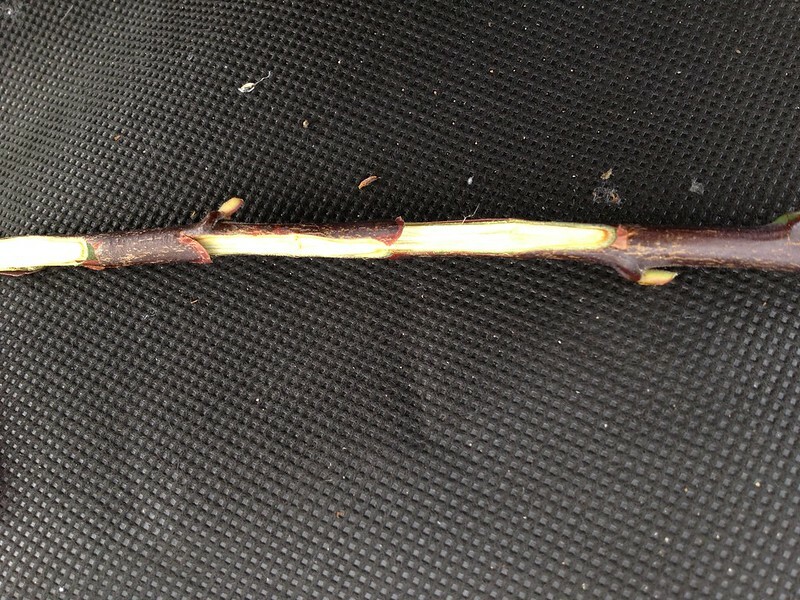 First, one has to collect the bud material: ripe new year wood, often found on the south facing side of a plant. The stems are trimmed of the leaves, leaving a small part of the petiole (it would be longer for T budding, as it would serve the purpose of a handle). They are then labelled and kept in a cool place, preferably wrapped in moist towel until use. Sometimes one cannot find first year wood, so it is possible to try with second year material. 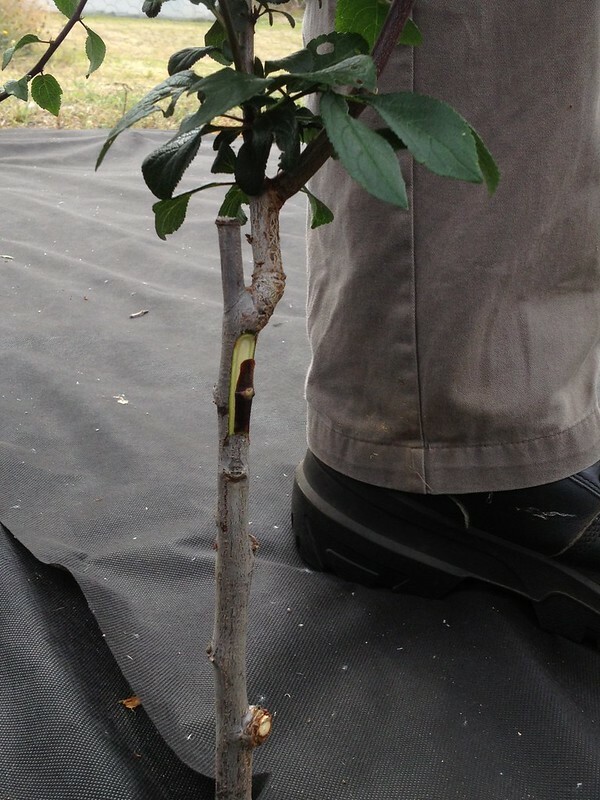 The buds are removed, one by one, with some 3-4 cm of stem around them: practicing a toe cut at the bottom and then sliding the budding knife from the top of the bud down to the toe cut. 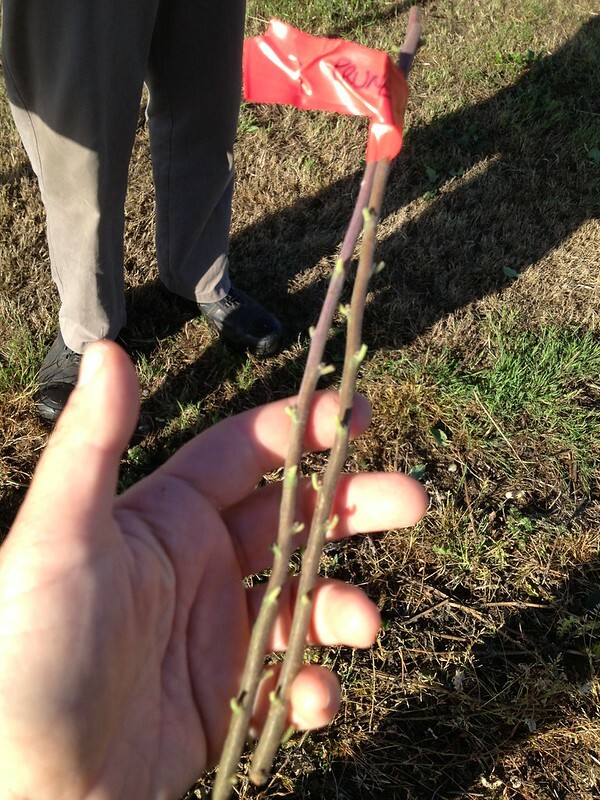 It is then the turn of the rootstock, which has to be previously cleared at the base for 20-30 cm. one makes another toe cut, then measures the lenght of the bud and cut a similarly sized slice out of the stem. The bud is then slid into the toe cut, ready for binding with grafting tape (a clear plastic strip). 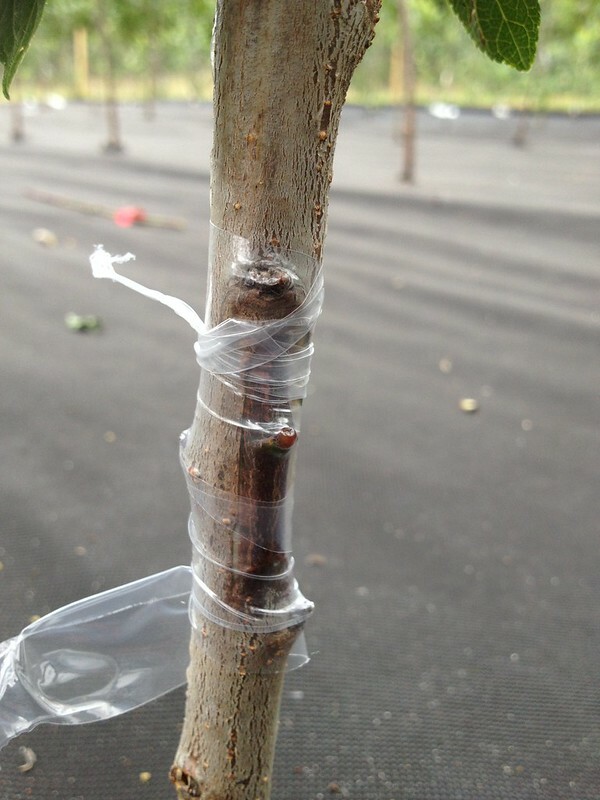 Binding needs to be tight: the fruit expert reckons that a good bud with bad binding has less likelihood to succeed than a so-so bud with good binding. The buds need to be covered by the tape too, unless it's too big to fit (i.e. on second year wood). The best way to bind is with clear stretchy grafting tape. This is tucked in at the bottom, then wrapped upwards, and closed with a knot, pulling any hanging bits to finish. Today I was in charge of the binding, and we went through some 90 rootstocks! The tape will be on for 4-6 weeks until callusing on the wound is well underway. 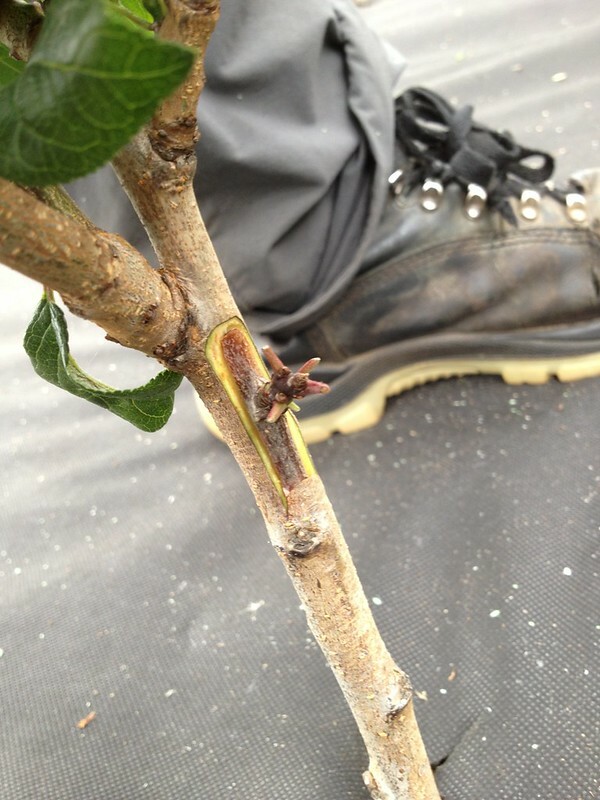 The fronds of the rootstock will be left on the whole season; cutting back will only take place next year in February (late February for apples), just when the sap start to rise, but before it's too strong, which may "flood" the bud and kill it.